Did the Fed do the right thing? 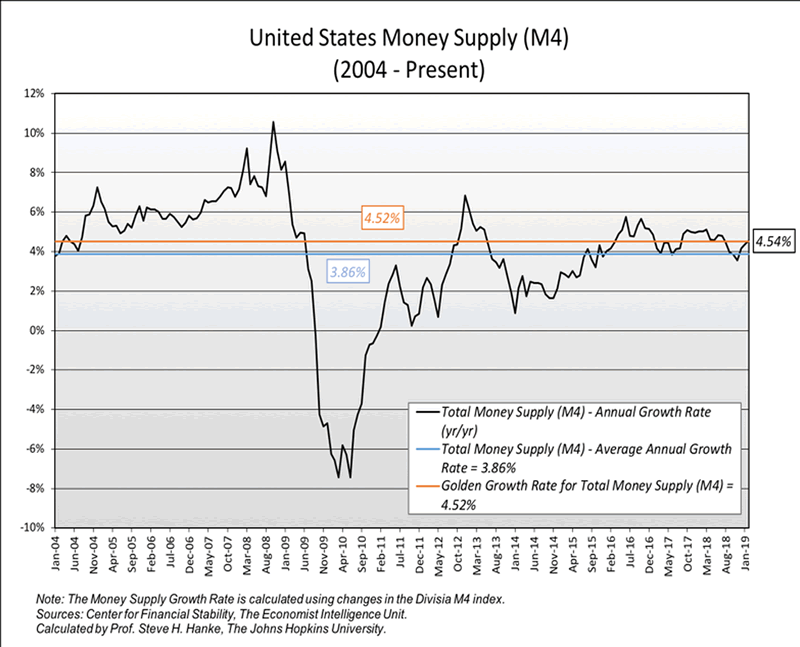 To answer that question, we must look at the money supply, broadly measured. Indeed, for me, a monetary approach to national income determination is what counts. The relationship between the growth rate of the money supply and nominal GDP is unambiguous and overwhelming. For example, just consider the U.S. from 2003 to 2018. The money supply (M4) grew at an annual rate of 3.59% and nominal GDP grew at a 3.62% annual rate. So, what is the current U.S. monetary temperature? Let’s first determine the “golden growth” rate for the money supply, and then compare the actual growth rate of the money supply in the U.S. to the golden growth rate. To calculate the golden growth rate, I use the quantity theory of money (QTM). The income form of the QTM states: MV=Py, where M is the money supply, V is the velocity of money, P is the price level, and y is real GDP (national income). Let’s use QTM to make some bench calculations to determine what the “golden growth” rate is for the money supply. This is the rate of broad money growth that would allow the Fed to hit its inflation target. I have calculated the golden growth rate from 2004 to the present. According to my calculations, the average percentage real GDP growth from January 2004 to the present was 1.91%, the average growth in Total Money Supply (M4) was 3.86%, and the average change in the velocity of money was -0.61%. Using these values and the Fed’s inflation target of 2.00%, I calculated the U.S. golden growth rate for Total Money (M4) to be 4.52%. Golden Growth Rate = Inflation Target + Average Real GDP Growth – Average Percentage Change in Velocity. So, the growth rate of money supply (M4), which has been 3.86%, has lagged behind the golden growth rate of 4.52% (see my calculations and the chart below). This suggests that, on average, there has been tightness on the part of the Fed over the 2004-present period. But, at present, the growth rate of M4 is 4.54%/year, which is almost right on the golden growth rate of 4.52%/year. 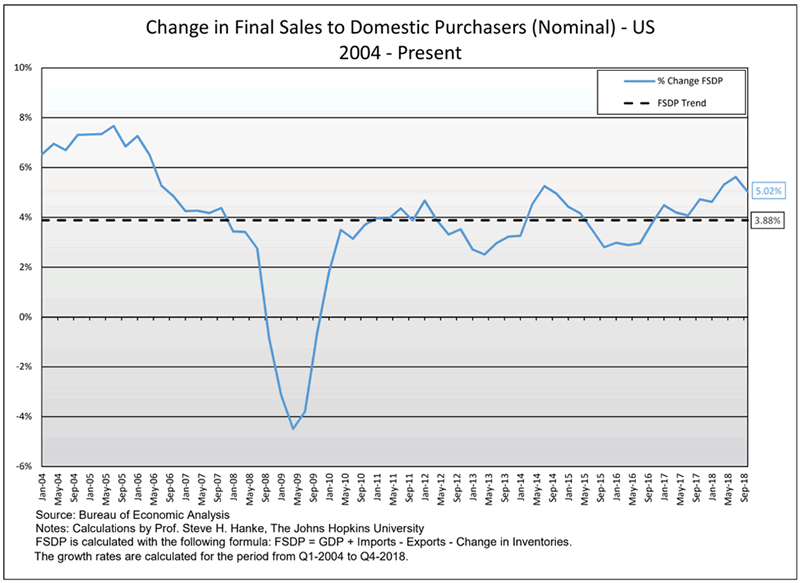 So, why did the Fed turn dovish? It’s all about regime uncertainty. As it turns out, the Fed is watching President Trump, and it has determined he is a loose cannon—one that creates regime uncertainty. Indeed, the President’s unanticipated zigs and zags create a pervasive uncertainty in both the national and international economic scene. In consequence, the Fed has lowered its economic forecasts and has wisely decided to play it safe.